[Note: On this day in 1663 the British King Charles II granted a royal charter to the colony of Rhode Island and Providence Plantations. A unique issue presented in this charter was the granting of full freedom of religion in the colony, a principle that paved the way for Rhode Island's insistence on the implementation of additional amendments specifying the basic rights of citizens, especially the first amendment, to the US Constitution before it would ratify that document in 1789. Rhode Island has a history of religious tolerance and freedom of conscience. It was originally a sanctuary for those fleeing the despotism of the Puritans in the Massachusetts Bay Colony; Roger Williams, founding father of the American Baptist movement, settled on the mainland at the head of Narragansett Bay, while Anne Hutchinson and her followers settled on Aquidneck Island (officially known as Rhode Island). In 1663 the two entities united as a single colony and were granted a charter by Charles II, the charter itself being written by Dr. John Clarke of Newport. The key phrase in that charter declared: "... that it is much on their hearts (if they may be permitted), to hold forth a lively experiment, that a most flourishing civil state may stand and best be maintained... with a full liberty in religious concerns." The charter further declared: "... that our royal will and pleasure is, that no person within the said colony, at any time hereafter, shall be in any wise molested, punished, disquieted, or called in question, for any differences of opinion in matters of religion, and do not actually disturb the civil peace of our said colony; but that all and every person and persons may, from time to time and at all times hereafter, freely and fully have and enjoy his and their own judgments and consciences in matters of religious concerns..."
The freedom of conscience guaranteed in the charter created in Rhode Island, and especially in Newport, a truly amazing religious diversity that added to the cultural wealth of its society. The Society of Friends (Quakers) became a major presence in Newport (which was the capital city of the colony, and later the state, until well into the 19th Century), and their Great Meeting House (built in 1699) eventually became the host of the New England Yearly Meeting of the Society (the New England Yearly Meeting was one of the sources of the Abolition movement). 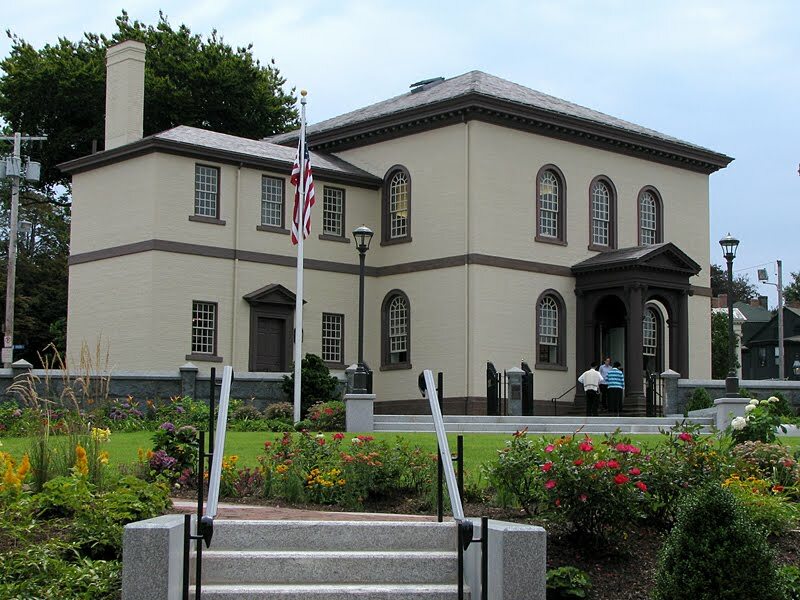 In 1658 fifteen Jewish families moved to Newport after hearing of the colony's "lively experiment" and founded the Congregation Jeshuat Israel. In 1759 the congregation purchased land and hired famed colonial architect Peter Harrison to design Touro Synagogue (named after Isaac Touro, the congregation's first spiritual leader). The synagogue was finished and dedicated in 1763, and is still standing today. Touro Synagogue also played a major role in establishing religious freedom in the newly established United States when a member of the congregation wrote to George Washington, who replied with his famous "To the Hebrew Congregation in Newport" , which stated that the government of the United States "gives to bigotry no sanction, to persecution no assistance..."
The Quaker and Jewish presences in Newport aren't the only result of that colonial charter, just the most famous. Newport is dotted with old buildings that, at the start of their history, served as houses of worship for small gatherings of believers: the Union Congregational Church on Division St., the first free African-American church in America; the Sabbatarian Meeting House on Touro St., now the home of the Newport Historical Society; The John Clarke Memorial Church on Spring St., one of the first churches of the American Baptist movement (and now pastored by a good friend of mine, Paul Hanson, a very genial, easy-going guy with a dry, wicked sense of humor); St. Paul's Methodist on Marlborough St., the first Methodist church to sport a steeple; and a score of other former churches which, like the Union Congregational church, have since been converted to residences. Because of the vision of the founders of the colony, and because of the guarantee of freedom of conscience written into their colonial charter at their request, Newport has a rich spiritual heritage and holds a major place in the development of the concept of religious freedom in the history of the United States. It's something we take pride in here, and something we celebrate. But look back at that original charter, that guarantee that within the colony no one would be pressured, harassed, punished, or otherwise disturbed because they enjoyed freedom of religious belief. How refreshing that is! And how far from the current state of affairs in the contemporary US, where we have a major effort being launched by religious despots, direct descendants of the Puritans of the Massachusetts Bay Colony, to impose their beliefs and their methods of governance on the people and the government of the United States. People who consider freedom of conscience to be "slack", "lax", "lazy", and most important of all, a sin. People who think that those who believe differently than they must either be converted or punished and removed from "their" society. People who would re-write our history to accommodate their own vision of what that history should have been. People who view any kind of diversity as evil. The colony of Rhode Island and Providence Plantations gained great benefit from their practice of freedom of conscience. Given the present situation, I think it's time that our entire country revived that "lively experiment." What say you?